I have posited the theory of change before: things always do, change. This is no different with relationships. Whether we like it or not, even our closest relationships change for better and for worse. Acknowledging that this change occurs is both healthy and necessary in ensuring they stay on track, and are sustained. It's a way of staying realistic about the dangers of relationship breakdown. Marriage is the issue here. Marriage is the closest human relationship. It is two people in love with each other, aligned in purpose and goal, giving of each other for the other; in theory at least, and certainly from the biblical standpoint, it's a substantially selfless relationship. With the inevitable seesawing movement in any relationship, of which marriage is no exception, there is movement closer to, and away from, the spouse. This occurs in "seasons" of marriage; little two month/two year blocks of time that characterize a phase where one or both partners can explore things, usually passions, either alone or together - pushing them apart or bringing them closer together. At times, this brings welcomed space, and at other times, not. Another thing that happens to marriages at times is they break. A key principle that I was reminded of just recently is that of attending to the primary relationship in marriage. That is, ensuring that the husband and wife ensure their relationship, above all, is nurtured, attended to and given room to breathe, grow and sustain life. Like anything, this takes time, effort, discipline, perception and awareness, notwithstanding the will to get it going, and keep it going. Getting it right means temporarily, occasionally, and regularly putting the other needs on the backburner, for instance, children, career, material acquisitions, other relationships and pastimes, and investing in the two who chose to become one in blessed matrimony. It is the primary relationship and the solid foundation required for children; with Mum and Dad being strong and close and unified, Son and Daughter do not have the strong support base they need to be safe, protected and succeed; yes, the children will miss out if this primary relationship their Mum and Dad share is faltering. They will be missing this vital need. If you're a guy, and I can say this because I am one, do the right thing and treat your marriage as your job; your most important job. I love it how Scott Haltzman M.D. puts it in his book, "The Secrets of Happily Married Men." (Wives might consider purchasing a copy and slipping it under their husband's pillow? Not all men take the hint though.) Men typically take their job and careers very seriously, expending effort over a long time period to ensure sustained success. Marriages also need this form of commitment. But, there is more. The marriage is the most important job, by far! It's not to say marriages are a job only because they're hard work, but it acknowledges the fact that they are: They are hard work, no matter who you're married to. 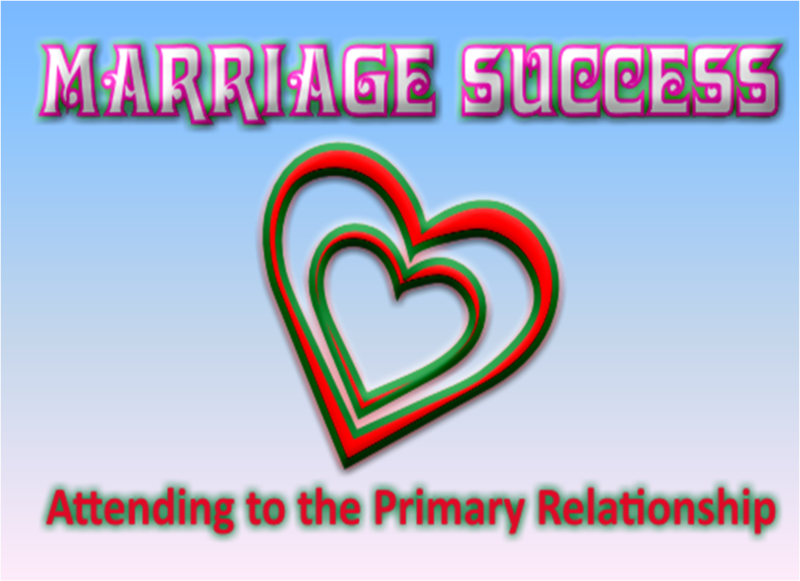 Marriage is the primary relationship within your family. It needs time, effort, encouragement, grace, space, breath... change, love, kindness, peace, work, study, time together, time alone, and a whole range of things we need to consider. Are your kids getting too much of you? Typically a big issue for some mothers, is Dad being 'squeezed out' because the kids take the vital room within the 'space' of the marriage. Is money imposing its demands on your marital situation? Are there other important people encroaching on your marital space, whether that is parents, in-laws, buddies, friends, or others? Do you have a pastime that pulls you away from your spouse? For any of these and more situations, there are signs that movement has occurred in the plates of your marriage. The choice is how to move back the plates so there is better alignment, before it is too late. Remember, some marriages break, and some marriages permanently weaken, leaving a lifeless couple (not to mention the kids) floundering through life, and you never want to go or "be" there. Be wise: Attend to your primary relationship, that one with your spouse.